We all have to grow up someday. And some of us are dealt a better hand than others—some during our childhood, others later in life, and even others not at all. But we find a way to persist, to perceive the world and how to function within its barriers. We learn how to love, to grow—and sometimes, more interestingly, we learn how to watch. 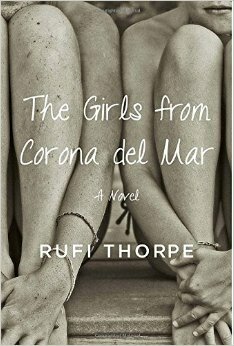 Rufi Thorpe’s The Girls from Corona del Mar is so completely about childhood friends growing up and growing apart, but it’s also about what some would perceive as luck (or luck running out) and the strange, voyeuristic qualities of our friendships tend to take on—particularly in those moments of attempting to “catch up,” that thrill—when friendships become distant, or even estranged. And as if these concepts weren’t complicated enough, Thorpe offers such beautiful, raw and emotional renderings that we (or at least I) lost touch with that boundary between narrative and reality. I cared for, and felt for, screamed at, rooted for and cried for, these characters more deeply than I often do for a story’s personalities. Because it’s more than that—a story; it’s more of a piece of historical fiction, really, telling truths about each of us with different names and slightly different situations. And yet it’s a story we’ve never heard before; we hurt for these characters, and we are surprised when they fall, and it feels perfectly natural and reasonable to want to catch them. This is a novel that envelops us and continues to hold on long after the last page. Perhaps what makes all of this so arresting is the disjunctive nature of their relationship; while Mia and Lorrie Ann grew up together in the small, seemingly-disadvantaged place of Corona del Mar, their memories are still tinged with nostalgic sunlight, their tanned skin and sun-kissed hair; there’s beauty, and a certain perfection, in those memories. And yet when these two young women have grown up, and come into situations where they truly need each other emotionally, they are often physically separated by great distances—and, at times, even greater apathy towards one another. While these two women were friends through and through, and always sought one another one for help (and to check in), there is a certain amount of perceived dislike, almost an obligatory forcing-together of their lives, contained in their relationship, as well. Unfortunately, though, this is fitting and regrettably true for many of us: we often maintain some of those relationships that are the most toxic for us because they’ve been established the longest, or we simply lose interest (again, because of the time that’s passed) and yet try (and fail) to maintain in touch, often out of obligation. Weirdly, though, there’s a certain amount of purity to this obligation—after all, that feeling of responsibility isn’t often forced by the other party, but rather the desire to maintain that which was once treasured. It’s interesting to think about how these emotions often played into not only Mia and Lorrie Ann’s decisions to see one another, but often how they treated or viewed one another (and their troubles or successes). But Rufi Thorpe doesn’t stop here—not even close. Much of this relationship, and its complications, are explored through consequences (both positive and negative) of our choices, and how those consequences can bring us to a new mental and physical state: becoming a mother, moving from the United States to Istanbul… these are two central occurrences in the book, but they are hardly exhaustive. And Mia and Lorrie Ann’s reactions to one another’s life events, often dark and judgmental, dismissive or cold, put a mirror to the core of their relationship, and often how broken it can be after their departure from Corona del Mar. What makes this even more stark is the initial glorification applied to Lorrie Ann, her life and her family, by the ever-watching Mia, who continues to watch with concern, and even a certain amount of fascination, as her friend’s life continues to change. My praise for this story, its complexities, and its characters, are endless. The story Rufi Thorpe has offered up provides all the twists and turns to keep you up and night, and then some. It’s taken me a great deal of time to process the book after finishing it, to process what I can even intellectually say about it, and (perhaps most importantly) to be able to move on to my next read without taking these characters with me and projecting them onto the new characters! This book is quite the experience. Slow yourself down a little bit, take a deep breath, and dive in. It isn’t an easy trip, but really, it shouldn’t be; honest and raw stories tend to pull you in several directions, run your emotions dry, and get you thinking about the truth behind the theme most thoroughly explored in the story (in this case, friendship, I’d say). And that is exactly the sort of trip you’ll go on with The Girls from Corona del Mar. It’ll be hard, but it’ll be worth it. I promise. RUFI THORPE received her MFA from the University of Virginia in 2009. Her novel, The Girls from Corona del Mar, was published by Knopf July 2014. A native of California, she currently lives in Washington D.C., with her husband and son. Next Tomorrow!! At the Kalamazoo Institute of the Arts! !